I love comic-book superhero movies, and I love graphic novels. But I’ve never managed to bring those two interests together because comic books seem to have a pretty high bar for entry. The mythologies for the characters go back for decades upon decades, and even though I know the stories get rebooted now and then, if you’re not in the comics world, you won’t necessarily know about the reboot until several issues have gone by. And, to be perfectly honest, the whole process of buying comics—deciding what series to follow, knowing when new issues come out, and finding a store that’s nice to newbies, especially middle-aged female newbies—just intimidates me. Plus, I’m not sure I want a bunch of paper comics cluttering up my small apartment. I have enough trouble keeping the book situation under control! 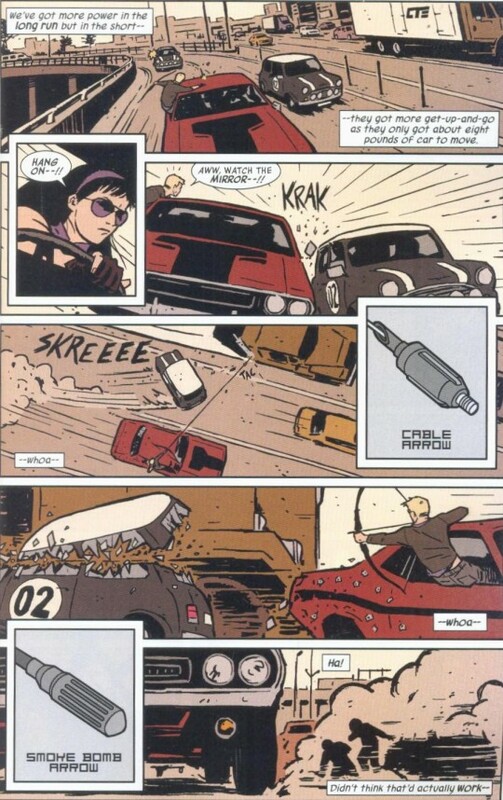 Clint Barton, aka Hawkeye, became the greatest sharpshooter known to man. He then joined the Avengers. This is what he does when he’s not being an avenger. That really is all you need to now. Easy enough, right? Thanks to the movie last summer, it’s common knowledge what the Avengers are, and the new series doesn’t dig particularly deeply into Hawkeye’s past or his work with the Avengers. I’m sure there are in jokes for those in the know, but newbies like me aren’t going to get lost. Kate took over for me as Hawkeye once upon a time when I was … well, dressing up like a ninja, sort of, is the short version. She is without a doubt the finest and most gifted bowman I’ve ever met but she’s like nine years old and spoiled rotten. Clint and Kate being very good at what they do. I love that little nod to the sometimes ridiculous complexity of comic-book mythologies. But mostly I love that Clint and Kate are partners in extreme competence and that they enjoy giving each other a hard time without the relationship feeling like banter meant to lead to romance. (It really needs to not go there.) The trade paperback, which includes issues 1–5 of Hawkeye, also includes issue 6 of The Young Avengers, which provides context for Clint and Kate’s relationship, but the quote above really tells you all you need to know. As for the story, the five issues in the trade paperback contain mostly self-contained stories, although the last two issues are a two-parter, and the same villains show up multiple times. I enjoyed the issues in the trade paperback so much that I decided to read more, and thanks to the Gender in Comics MOOC, I’ve discovered Comixology, a site that offers digital comics, so finding and storing hard copies isn’t a concern. The series is now up to nine issues, and the storyline is getting more complex, but there’s still no great need to delve into Avengers mythology. Clint tells readers what they need to know as the story goes along—in a couple of cases, I’ve wanted to know more, but Google has been good for that. So if you’re interested in superhero comics—and perhaps even if you’re not—this series is a great way to dip into the genre without having to educate yourself on years of background. Plus, it’s a lot of fun. On a related note, I also read Superman: Birthright by Mark Waid for the MOOC, and although it was sufficiently entertaining, I don’t see myself becoming a big Superman fan. I think he’s just too powerful to interest me much. 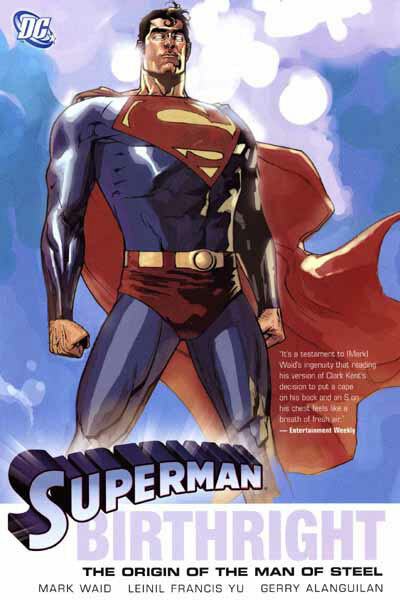 This series was an updated version of his origin story that puts him in a more contemporary context, with Ma Kent running and website and the Daily Planet focused on being the first to post a big story online. Some bits of the story were clever, and I liked the way Clark struggled with people treating him differently because of his powers. The Superman persona is developed as a way for him to use his powers to do good while still being able to live in the world as Clark. The trouble is, Clark is as much (perhaps more) of a faked persona as Superman is. So the poor guy never really gets to be fully himself. That aspect of the story is never explored as well as it could be—I think maybe the Superman persona is meant to be the real him, but he only puts on the costume when needed, and he still has to be a guy who pays the bills and buys groceries and all that. So if Superman is his real identity, he hardly ever spends time being the real him. It’s a sad state of affairs, and if that aspect of his life had gotten more attention, I would have found this series fascinating. Instead, there’s a lot of time focused on his past with Lex Luthor, and I’ve just never bought the idea that they knew each other as kids. I didn’t buy it on Smallville, and I didn’t buy it here. Here, it seemed especially goofy because Lex claims to have forgotten all about knowing Clark, which may or may not be true. Either way, it doesn’t make much sense, and I felt like Waid really wanted it to be true, so he just breezed past the logical problems. It was fun to read, but seemed to fall apart the more I thought about it. However, it’s always possible that when I think about it some more and read the comments on the MOOC discussion boards, I’ll be able to put the storyline back together in a satisfying way. 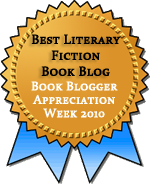 This entry was posted in Fiction, Graphic Novels / Comics, Uncategorized. Bookmark the permalink. Well, since you put them together, even if by coincidence – if you enjoyed Hawkeye and enjoyed something by Mark Waid, you might well have a good time with Waid’s current version of Daredevil, which shares Hawkeye‘s visual panache, human-level perspective, and ease of entry (or so I would guess). It unfortunately does not have a Kate Bishop counterpart. 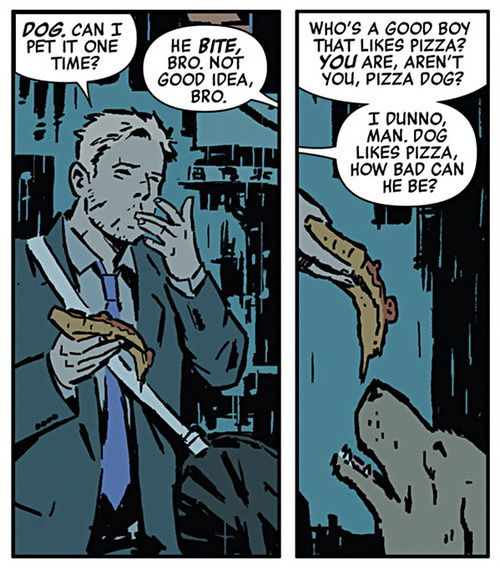 For readers who know (much) older versions of Hawkeye, there are some amusing discordances. Would you believe that Clint Barton was married for quite a while in the 1980s? In other words, possibly back before the current version was born? That Hawkeye seems older than this Hawkeye, actually. Comic book time moves in strange ways. Come to think of it, real time moves in strange ways. That was thirty years ago I was reading stories about Hawkeye? Impossible! I definitely don’t think the story’s taking Kate and Clint in a romantic direction. I agree, that really needs to not happen; and truly, I don’t think it will. Clint doesn’t seem to see her that way, and I think she’s much too sensible in any case to get involved with him. So. It will all just be banter and purple clothes. I don’t think so either, but I’ve been let down so many times. As they are now, it makes no sense on either side, and I love their relationship as it is. And have you read the latest issue yet? I gasped right out loud at the end. It was most upsetting. Why did I have to get into the series right when they go for the shocking ending? AH I KNOW! I just read it. It bummed me out enormously. I gasped out loud. On the other hand, the Clint/Kate friend stuff was all really great and touching. Er, but mostly, DAMN, this issue was really depressing on a bunch of levels. I love the Hawkeye series so much right now. I am happy that it’s mostly self-contained stories, and I hope they aren’t going to move away too much from that. But I think as long as they don’t go for a Clint and Kate romance I’ll be happy. And how great is it that they’re both called Hawkeye and there’s no confusion? No need for her to be Lady Hawkeye or anything. The last couple of issues seem to be going for more of an arc, so we’ll see how self-contained it remains. I think the single stories with recurring elements had worked well so far. And I totally agree about how great it is that they’re both Hawkeye. I also love that he calls her a bowman, and there’s none of this pretty good for a girl nonsense. Make that another recommendation for Waid’s take on Daredevil. Hawkeye sounds amazing and is already on my list. Superman: Birthright sounds very disappointing, however. I think the right way to write Superman, due to the aforementioned fact that he’s extremely powerful, is to focus on how human he is. At the end of the day, he is Clark Kent; Superman is just an alias. (This is also a nice contrast with batman, where Bruce Wayne has just become an alias.) By focusing on the fact that Clark would be out doing his best to save the world regardless of whether or not he was an alien with superpowers, you humanize him and make him relatable. I don’t care for takes that focus heavily on him being Superman versus being Clark. I’ll be reading issue 1 of Daredevil in the next day or two. Now I’m really looking forward to it! I think you’ll love Hawkeye. I think focusing on Clark, which the first issues of Birthright did, does make him more appealing and relatable. And I thought the series did some neat things with that tension between Clark as powerful and Clark needing to be a regular guy. There’s a whole bit where Ma Kent explains coaches him on his posture and wardrobe so he’ll blend in better. (No T-shirts! Those pecs are too hard to ignore!) The idea that he ends up acting all the time, no matter which persona he’s inhabiting, was be really interesting, but the series didn’t go deep enough into that. The Luthor stuff ended up getting too much attention, and it was a lot less interesting. Comixology was the only one I investigated–they were offering a discount on all the books on the MOOC reading list, which is how I found them. And they seem to have a good selection. I’ve been reading on both my laptop and with their Android app on my phone, and both ways work fine. It’s a sad, sad development, but not the saddest possible.